Now, I had to really think about this one. Gear is the first thing that comes to mind when I think of favorites but I’m still very new to triathlon and I’m still in the beginning of building my collection. Not to mention, Triathlon is one heck of an expensive sport! If you’re not careful you can spend a fortune in the blink of an eye. Not all of my favorites are gear related however, there are some pretty awesome things that come to mind when I think about triathlon. I wanted to highlight more than just gear. With that being said, below are some of favorites. I will do my best to link products so that if any of you readers are interested you can shop around. This may not be a triathlon specific favorite but it has been an instrumental tool in my triathlon training this season. 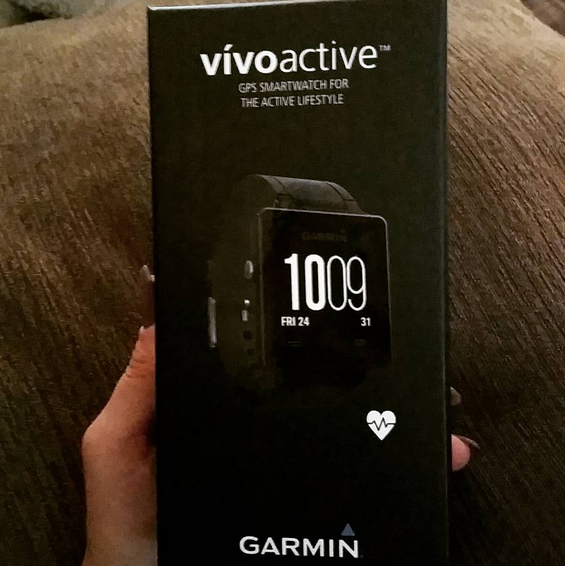 In my opinion, if you’re going to give any kind of serious training a try, it’s essential that you find a GPS/Heart rate monitoring watch similar to this. Now, the Garmin Vivo active is what I’m currently using but before I had it I used the Garmin Forerunner 110 and I loved it. The Vivo Active was a pretty awesome upgrade. It has so many neat tools built in. I can download apps from the Garmin connect store and upload them right to the watch via bluetooth. It tracks my sleep patterns, its waterproof so that I can take it on swims, and it even counts my steps throughout the day and reminds me when I need to get up from my desk and move. The stock HR monitor is also waterproof and you can also purchase additional sensors for bike rides that will pair with the Garmin to track speed and cadence. The only issues I’ve noticed so far are that it may have inaccurate lap counts when swimming indoors and the GPS feature does not work in open swims. Total bummer for me on that end but I feel like it more than makes up for in other areas. This book was gifted to me by one of my in-laws when I first decided to take on triathlon as a new hobby. I read it front to back. I knew nothing about training (and still don’t know a heck of a lot) and had no idea where to start. The triathlon training bible goes over gear needed, how to build weekly training plans, and even how to prep for race day. 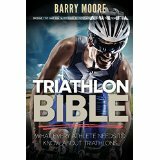 It’s basically one big overview of triathlon training and was the perfect introduction to the sport. I highly suggest this for anyone who is just getting started. I can still remember the day I discovered “Triathlon” blogs. I had no idea people blogged about this stuff. I hadn’t really read very many blogs that I didn’t find on Pinterest. 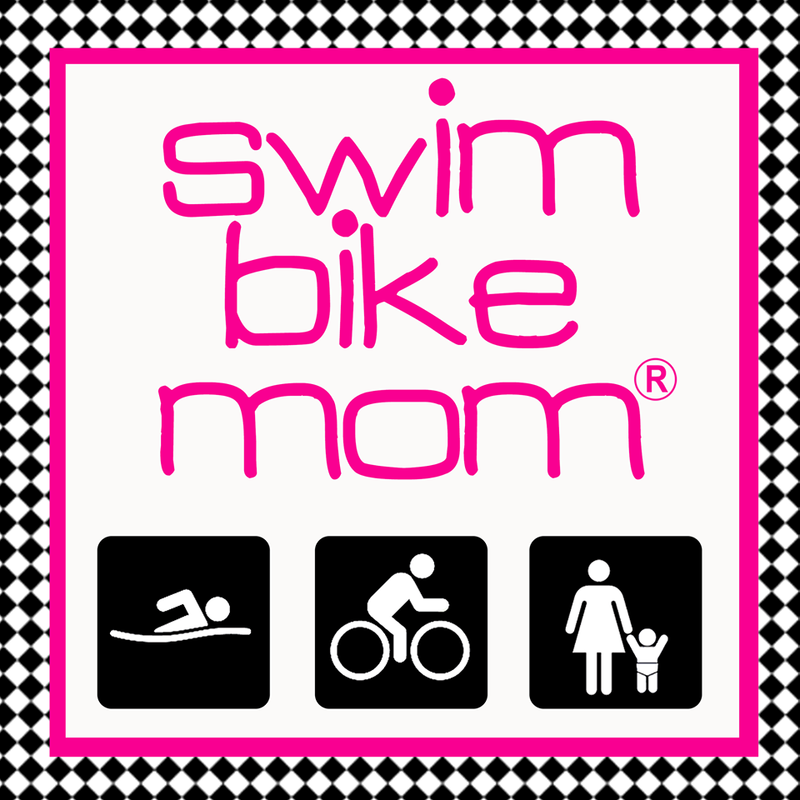 Swim Bike Mom is a blog written by Meredith Atwood, Author of Triathlon for Every Woman. She blogs about her life as a mom/lawyer/triathlete. Back when I first discovered triathlon and around the same time I started my blog, I discovered Swim Bike Mom. What I love about her is that she is a normal every day mom, just like so many of us! She’s not a pro athlete, she’s not super-fast, she’s just a normal age-grouper balancing work, life, and being a mom while pursuing her dream of racing triathlon. Meredith is such an inspiration to me and her blog was very motivational when I finally made the leap into triathlon. She gave me confidence that I too could race this multisport that I’ve grown to love. I’m constantly looking for triathlon tips. The Ironman.com blog always has great information from open water swimming to race day check lists, even to how to improve your run or swim. It’s a great resource for beginner athletes. It’s my go-to when I have triathlon related questions about anything. I mentioned the issues I had in my first triathlon due to poor clothing choices in my last Tri Talk Tuesday post. I’ve evolved a lot since then…I think. I purchased my first tri suit from Swimoutlet.com and it seriously made all the difference in the world. A triathlon suit is a once piece article of clothing that you can wear on the swim, the bike, and the run without having to change or worry about fabric rising or bunching up. 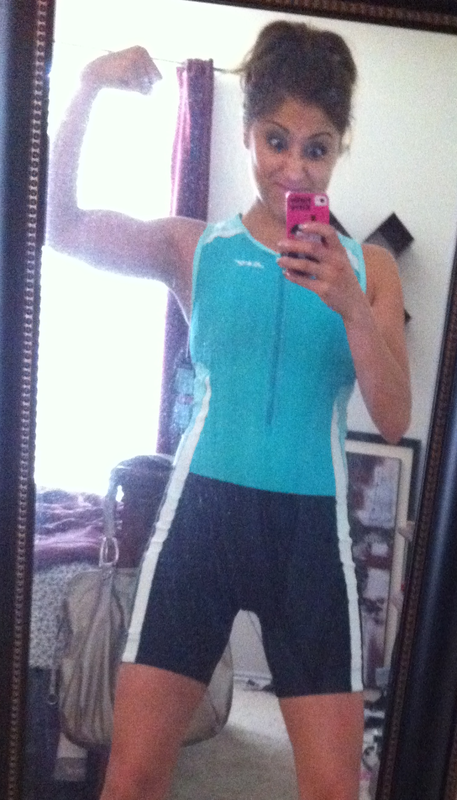 I have since grown out of it and haven’t had a chance to purchase a new one but I swear by triathlon suits. They have a thinner chamois to avoid retaining water in the seat, some come with built in sports bras, and the legs are a little longer to avoid the dreaded thigh chaffing. You can also purchase tri shorts and tops that come as separates (which I’m racing in now) but I hate tugging on the top to stay down. Hopefully, in a few more weeks I will be able to fit back into my old trusty tri suit. That’s the beauty of training for a big race. Any weight gained in the off-season eventually disappears! I still hate to ride on the open road. I’m afraid of cars! My current bike is a little janky and the gears can be a pain so I’d rather ride on a paved trail or indoors when training for the bike leg of a tri. 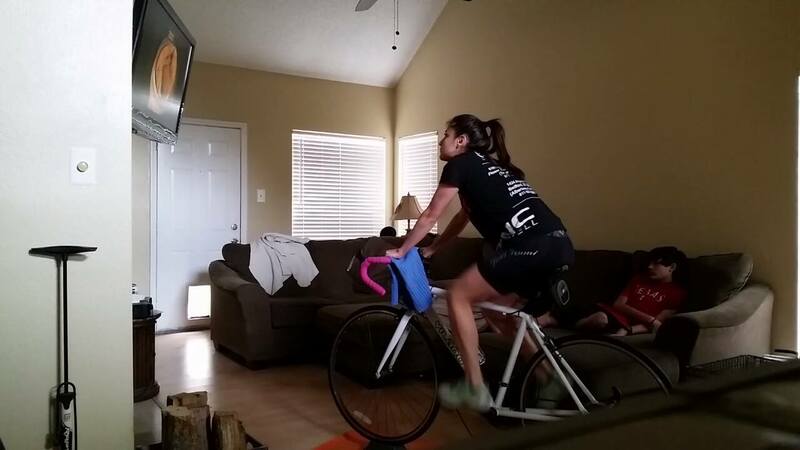 My indoor trainer has been AWESOME. It doesn’t matter what the weather is, what time of day it is, or how much time I have. 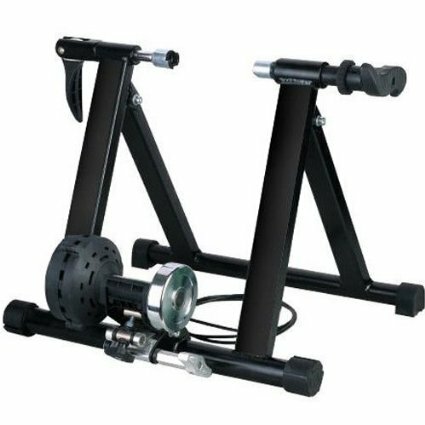 I can set my bike up on the indoor trainer and ride while watching TV or while playing videos on YouTube. More importantly I can ride AT HOME. It’s perfect. There are some many great (expensive) options out there but I went with a basic mag (magnetic) trainer and it suits me just fine. I can dial up the resistance for hill training or dial down for endurance rides. It suits every need. So those are some of my favorites! I have an entire wish list of items that I’m hoping to add to my favorites this year but my pocket book will only allow for so many toys at one time. What are some of your triathlon favorites? Share in the comments below. I agree with you – bike trainers are great! I try to soak up as much outdoor riding as I can this time of year while I've got the daylight to do it…soon it will be indoors except for the weekend rides. I don't mind that so much, it is just different. Living in the great white north, I spend about 50% of my time on the trainer, ha ha. I try to ride outside for as long as possible but those mid week rides are next to impossible when you have to do them in the morning and it's pitch black out. So I head to the basement. 🙂 I've been doing triathlon for over 10 years now and I STILL find great articles on Ironman.com – it's an amazing source of information!